What a beautiful picture of the river. April has arrived here with sun and rain and hail… but I love it. The days are getting longer and the spring flowers were absolutely stunning on my walk today (of course I hadn’t taken a camera). Why everyone cannot appreciate the joys of the natural world I really don’t know, but even if the outdoors is not your thing, everyone wants oxygen and food to eat and we won’t have either of these if we don’t start to be more careful with this planet of ours. How true and so well put. A wonderful photograph to welcome April. A lovely post Laurie. Yesterday I travelled via mountains and even the snow filled mountains were looking so serene. Yay for April! So grateful for the early work of the EPA, lately, however, it has been a disappointment to say the least. Sure has! Hoping for happier results in the next election. And happy Earth month to you and those darling whippets. Happy earth month! I’m glad things were cleaned up. I remember rivers catching fire (how weird is that?) and hope we never see that again. Thanks, Lisa! You and me, too. Good thoughts to go with a good month. Lovely post. There have been some great strides in conservation here too. The bird called the kaka, that we now see every day where we live, was almost extinct, and thanks to Zealandia sanctuary, is now seen in many parts of Wellington. Thank you for introducing a bird I had never heard of. Always great to learn something new. Also, many, many thanks for telling me the heartening story about this birds. Wonderful to hear a happy ending. Thank you for your dedication to the Earth. You inspire us to be better stewards. A very interesting post Laurie, my husband Paul is born on the 22nd April, and we didn’t know it was earth day, so we will remember this on his birthday. It is always such a relief/pleasure to see that a river has been cleaned up, but it seems we have to be vigilant. We’ll have a toast to that sentiment on his birthday! Happy Earth Day, happy birthday to your husband. So good to hear a positive story about the environment. Sure is! 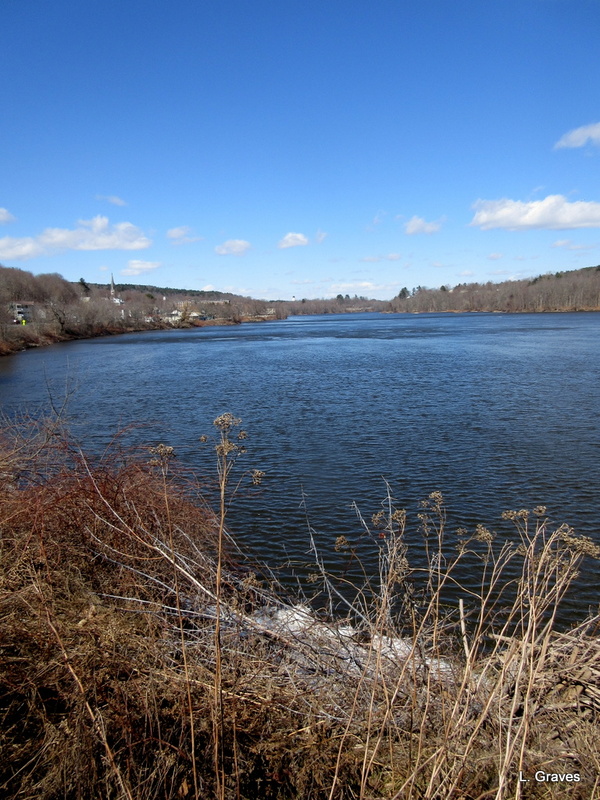 I think about the change every time I see the Kennebec. That looks like a beautiful river – it’s nice to read an environmental success story for a change. In the US, many, many rivers got a second chance because of the Clean Water Act. It seems that government can do some good, when it wants to. Looking good, Kennebec! It seems there’s a greater sense of urgency, though, this year, when we come to Earth Month . . . . Loved reading this and feel as you do about cleaning and protecting our earth and water supply. Silly humans have no understanding as I didn’t either for so many years. Of course in the early years, we had nothing so nothing went to waste. When we know better, we do better so there are no excuses now. We are responsible for what is being allowed to happen. I also have a daughter born in April. A Friday the 13th to be exact. 😉 My lucky day. And when she married many years ago, it was on April 22 with the wedding in a park and reception in our yard. She gave tree seedlings to each guest to plant. She already had a full understanding and has worked diligently all her life to be of service to the land. She actually works for Energy Trust here. That was her dream job. Lovely story about your daughter and her wedding. Happy anniversary to her and her partner! Hooray for Earth Protectors everywhere! Yes! Yay! New superhero series? Great post, Laurie – I, too, have seen progress. I NEVER saw a bald eagle growing up – ever. I still live in South Jersey, where I grew up, and they are around. I’ll see them several times a year from my yard and my mom see a nesting pair where she lives. It’s never too late to make a change for the better and those changes make a difference. We must keep the images of progress with us during these discouraging times. Same is true for me about the eagles. They were nearly extinct. And now, the eagles have rebounded, and I, too, see them frequently. Wonderful that you have them so close to where you live. And you are exactly right about changes making a difference. I would also add that it’s of vital importance for the government to be involved. Lots going on around Earth Day. Thanks for this post. With all the problems we face, it’s easy to forget all the progress that has been made in terms of clean air and water. Although we face huge problems, much progress has indeed been made. With the help of the federal government. How about that?